This is November 18th, 2014 and if all goes well, on the 29th of November I hope to add a "free shower" to this blog. The idea is that the propane flow-through water heater has been replaced by a smaller unit having the same amount of hot water delivery. However, even the newer unit requires fossil fuel in the form of propane to heat the water. The ultimate is to have a shower in mid November that has hot water heated by the sun's warmth. In short, a prototype hot water heating system will be laid beneath the photovoltaic electric production array atop the MOG yacht and directed to the shower area. The system will be unsophisticated but should demonstrate the heating ability of the area and efficacy of the idea. The amount of water, temperature, flow and possibility for integration will be monitored on the user. The idea had better work very well, the user will be Hillary, supportive wife of over 36 years. If the idea does not pass her empirical test, more than the shower system will be in hot water. Look forward to the next install of this post to see how the life of this inventor is working out for him. A day late but not a dollar short. Hillary was starting to feel a cold coming on so she took to the valve on the hose bib and I was the one to take the shower. I used a simple series of four 50 foot garden hoses laid directly on the roof. 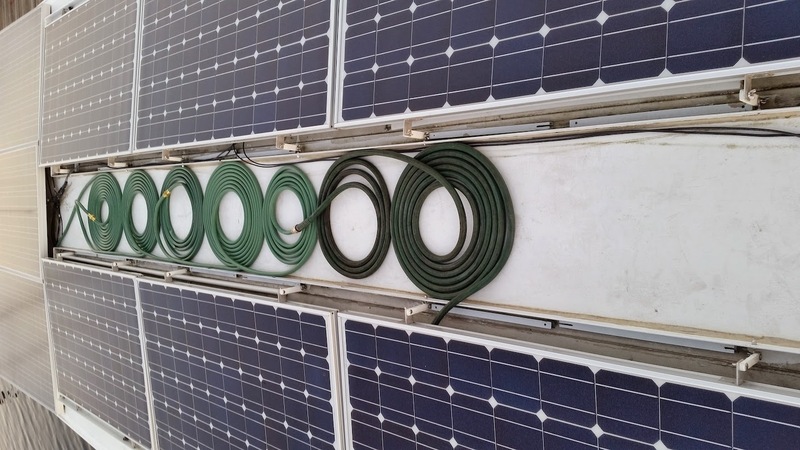 There was no attempt made to insulate or concentrate the sun's energy shining on the hoses, no glass top, foil lining, black coloring or placement under the PV array atop the boat, as shown below. Temperature of propane heated water over 110 F (97 F for finishing shower). I got wet with the roof heated water and lathered my head and shoulders, then the water temperature dropped to cold. For about 1.5 minutes the water was above tepid and a decent shower (if the temperature was sustained at 88 F) could be made of it. I had worse in the military in the winters of Germany but this is now, not then and there. After a few brief temperature measurements, the propane, flowthrough water heater went into action. The freshly heated water was appreciated, propelling my mind from the frosty fields of German artillery ranges to the comforting surroundings of the Cape Fear Marina of Wilmington, NC. In a pinch, such a simple water heating system would suffice but certainly not if the outside temperature dipped to 32 F. For those types of temperatures the system envisioned needs to be enclosed, insulated and have blackened collection surfaces. Such systems do exist. The reason for this particular test is to set an empirical base line for a specific configuration (a most simple one) to which all improvements and comparisons can be made. The roof area available is about 1'8" by 16'6" or nearly 28 square feet. For comparison, a 4x8 sheet of plywood is 32 square feet. I will need to generate a steady stream of warm shower water by using less than a sheet of plywood's surface for heating water to 95 F at the outlet in the shower stall. All that without the use of propane. Solar water heating drastically reduces the need and cost of propane water heating. The correctly sized solar water heater will provide a continuous flow of hot water for bathing most of the year. In the coldest months, the sun will preheat water entering the propane water heater, thus lowering the amount of propane required to get the water hot enough for a shower. Very few marinas stock propane tanks and the delivery of such a fuel is slim to none on the Mississippi river. Most yachts burn diesel fuel in a generator, to make electricity, to heat water for a shower. That is costly, inefficient, noisey and stinky. The Mrs. and I like smelling clean as well as being clean. So now you know my winter assignment. 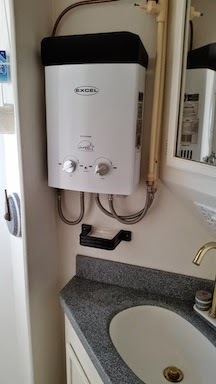 Hot water in the summer is no problem but the near winter time period and resulting temperatures are the challenge. I will keep you posted as to the options and final system structure. The crude test water heater is actually just four green garden hoses connected in series to yield about 1.5 minutes heated water. The water being pumped up to the roof was from the internal water tanks at a chilly 58 degrees F. The picture orientation is the roof top between port & starboard PV panels. Old propane water heater unit (top) replaced by new demand gas water heater (bottom).